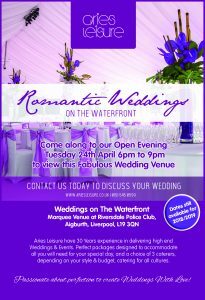 This week saw the launch of Weddings On The Waterfront at Riversdale Police Club, Riversdale Road, Aigburth, Liverpool, L19 3QN. 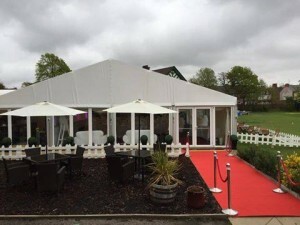 A Fabulous Marquee Venue with Fabulous River Mersey Views. The event was hosted by Aries Events and supported By Absolutely Fabulous Gin Festival. Absolutely Fabulous Gin Festival work with lots of Gin brands and always have access to the latest Gins that enter the market. Their mixer partner sponsor is Fever-Tree – Mix with the Best!. Brand support Sponsors on the day were Halewood International and Lakes Gin. Halewood International who are the UK’s largest independent drinks manufacturer and distributor by volume, based in Huyton, Liverpool provided minature bottles for the ‘Gin Wedding Favours’ from their Liverpool Gin range and their attractive brightly coloured bottles of Whitley Neil. Lakes Distillery from the Lake District National Park showcased their Lakes Gin liqueurs – perfectly served with Prosecco as a wonderful Gin Themed Welcome Drink. Rhubarb and Rosehip was among the selection that has just been launched this week. Absolutely Fabulous Gin Festival provided a welcome drink on the day which was a Gin which everybody loves the Liverpool Gin Rose Petal, served with garnishes in their ‘Absolutely Fabulous Gin Copa Glass’. Absolutely Fabulous Gin Festival provides large Gin Festival Events in prestigious Venues throughout Liverpool, they will have over 80 Gins on offer at this newest Gin Themed Wedding Venue. There are three caterers available for this venue, who offer fabulous Gin Themed Menu’s to fit in with the theme, Menu’s and samples will be available on the open night this month. Lisa from Aries Events said as Gin is the Nations Best Loved Spirit we wanted to offer our Brides and Grooms the opportunity for a “Gin Themed Wedding Venue” – Let The Wedding Be-Gin!.. Lisa said it’s an all round Gin Lovers Dream!.. The Wedding Open Evening gives you the opportunity to meet the suppliers behind this wonderful new Wedding Venue and sample a Gin! Are you Miss Gin looking for Mr Tonic?.. If you are looking for somewhere unique to say “i do” Lorraine Hull a local celebrant will be here on the evening giving you some inspiring ideas for your ceremony. We also have Struth Photography – The Wedding Awards 2018 Winners and the fabulous Jay Bradbury on his baby white grand piano. Don’t worry if you are not a Gin lover or worried about what other guests will drink, there is a fully stocked premium wedding bar set up, including a selection of beers, wines and other spirits. Show offers available on the evening if you book. Riversdale police Club, Riversdale Road, Liverpool, L19 3QN. This is a FREE Event. Wedding Venues Liverpool – Wedding Open Evening – Tuesday 24th April 2018 – 6pm till 9pm. Weddings On The Waterfront at Riversdale Police Club, Aigburth, Liverpool, L19 3QN. Fabulous Waterfront Marquee Venue overlooking the Famous River Mersey. Join us for Our open evening at this Fabulous Exclusive Wedding Marquee Venue in Liverpool. Set in grounds of Riversdale Police Club, Aigburth South Liverpool. Offering fabulous River Mersey Views. Tuesday 24th April 2018 6pm till 9pm come and join us to view this Fabulous Wedding Venue with HUGE savings on normal marquee hire prices. Are you looking for Wedding Venues in Liverpool that offer fantastic Wedding packages? This is a FREE event and a great opportunity to view this Wedding Venue. If you have any enquiries regarding this event please call 01515450599. Follow our event on FACEBOOK. We look forward to seeing you all there!..